Should You Bare Your Feet. This article is was published in a major Runners magazine and should be read as an intro to the idea of running barefoot. Considering that a majority of the magazines funding comes from the sneaker industry. So don’t let anyone sway your decision to understand your body a little more by taking the time to know your feet. Most of us consider running shoes essential. But what happens when you decide not to lace ’em up? As a teenager, I loved to run barefoot on the Connecticut beaches, splashing through the waves. 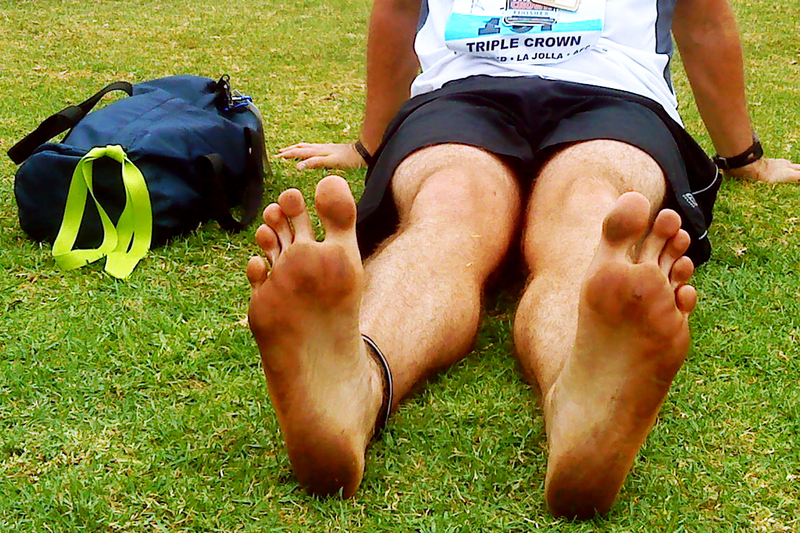 A few years later, I often ran without shoes while training for the college cross-country season, completing workouts that were the hardest, fastest, most puke-able, and yet most enjoyable of my life. Those are strange bedfellows: extreme effort and high pleasure. I have wondered if someone was spiking my Kool-Aid, a popular sports drink of the time. Then I close my eyes and recall how my friends and I snuck onto Shennecossett Golf Course as dusk descended. How we giddily removed our shoes, and felt the fairway underfoot. How we ran an undulating six-mile fartlek loop, sprinting and jogging, sprinting and jogging, the summer sweat cascading off our bodies. How we finished, not another gasp of oxygen in our lungs, and flopped onto the 14th green. The kinesthetic memories are fullblown, from the slight chill of the grass on my feet to the heaving chest and the lightheaded dizziness of the effort. Was it the barefoot running that made the memory so vivid? Famous runners had gone barefoot before us, of course. In 1960 Ethiopia’s Abebe Bikila, the greatest Olympic marathoner of all time, won the first of his consecutive gold medals sans shoes in a world record 2:15:17. My high school coach, “Young John” J. Kelley, was the leading American finisher (19th, 2:24:58) in that 1960 Rome Olympic Marathon, and his descriptions of the torchlit race have always entranced me. Except the part about the stones. That wouldn’t apply to either Charlie “Doc” Robbins or Zola Budd, both important contributors to barefoot running. Robbins, winner of two USA National Marathon Championships in the late 1940s, completed 50 straight Thanksgiving Day Road Races in Manchester, Connecticut, before calling it quits two years ago. Most Thanksgivings, Robbins went shoeless, though he would resort to a pair of socks if the temperature dipped below 20 degrees. Interest in barefoot running seemed to wane until 2001, when Michael Warburton, an Aussie physical therapist and 2:42 marathoner, published an online paper titled, simply, “Barefoot Running.” (You can view the paper at the sports science web site sportsci.org.) In his section on running economy, Warburton points out that the extra weight of shoes on your feet is much worse than a pound or two around your middle. Weight on your feet is subject to constant acceleration and deceleration (runners call these movements “strides”), which have a high energy cost. According to Warburton, research has shown that 100 grams of extra weight on your feet decreases your running economy by one percent. Simple math says that two 10-ounce shoes will make you more than five percent less efficient. That’s a big deal. When you add five percent to Paul Tergat’s marathon world record 2:04:55, he’s a 2:11 guy, which doesn’t net him enough for a warm bowl of ugali in the Kenyan highlands. But we don’t think much about running economy when we buy a pair of new running shoes. First we want protection from harmful objects. And then we expect cushioning and/or motion control–the stuff of injury prevention. But this is where things get strange, because scientific studies have had a hard time proving that shoes represent a big step forward from the naked foot. To learn what’s going on inside the body, which, after all, is where we runners develop all our stress fractures, Achilles strains, and so forth, a medical team needs to take measurements from–ouch!–inside the body. I’ve actually seen this take place in a biomechanics lab, and it’s a blood sport. The combatants typically include a mad Ph.D. scientist and several grad students (a.k.a. the “volunteers”) desperate to finish their degree work. (“Sure, I’ll be happy to let you drill a metal accelerometer into my shin bone before my next treadmill run,” says a grad student.) The results of several of these intrusive experiments have shown little change in shock absorption or motion-control in shod versus unclad feet. This apparent difference seems hard to believe. All that foam padding and all those posts, bridges, and dual-density midsoles have to be doing something, right? Of course they are; they’re deceiving the body. Here’s an explanation, based on your body’s proprioceptive abilities–that is, the way it can communicate up and down all pathways. When you run barefoot, your body precisely engages your vision, your brain, the soles of your feet, and all the muscles, bones, tendons, and supporting structures of your feet and legs. They leap to red alert, and give you a high degree of protection from the varied pressures and forces of running. The way I see it, there’s a simple explanation for the high IQ of barefoot running: We descended from the trees to walk and run this planet’s surfaces six million years ago, and we’ve had time to get really, really good at it, from the soles of the feet to the top of the brain. By now, you might be worried about your Reebok stock or your friends who work at the local running store. I wouldn’t sweat it too much, at least not to judge from the number of bare feet I saw at my last big road race (zero). Even though a guy named Ken Saxton is running a marathon a month this year (barefootrunning.org), I doubt his preference will take off the way instant messaging, low-carb diets, and The Apprentice have. This a-little-medicine-is-good-for-you perspective is shared by a number of other podiatrists, physical therapists, and coaches. Their theory: Modern man does spend too much time in shoes, and this weakens many of the foot and leg structures. To correct this, you can walk barefoot around the house, do simple foot strengthening exercises, or run a few barefoot miles a week on safe, secure surfaces. And then put your shoes back on before you hit the pavement. Even Abebe Bikila gave up his barefoot ways. Four years after winning in Rome, he wore Pumas in the Tokyo Olympic Marathon. He won again, despite having had an appendectomy 40 days earlier, and set a new world record, 2:12:11.2. Apparently, the shoes didn’t bother him at all. Next > The breath of a Yogi can save your life.